Well, it’s definitely taken me nearly three weeks to write this, but I still haven’t been able to let this post go so I’m still rolling with it! I can’t stop thinking about the Super Bowl. Alright, that’s a stretch. But after the largest comeback win ever to happen in a Super Bowl, Lady Gaga bringing a ‘normal’ performance, Tom Brady winning his 5th ring to seal his fate as the “greatest quarterback ever” and the complete collapse of the Falcons in the second half, I really haven’t been able to get rid of a thought that keeps milling around in my head. The Atlanta Falcons all but had the Super Bowl in the bag, 25 points up, outplaying the Patriots at every position. Then the second half occurred. I don’t know what happened during the Falcons halftime (maybe the ‘crazy Gaga’ we all expected), but they came out flat and looked like a completely different team. Whether the Patriots won the game or the Falcons gave it away, I’m still not sure. What I do know is my perception of the second half Falcons has left an imprint on me. So back to that thought I’ve had milling around in my head. I’m not going to sit here and say I have a clue concerning professional football, but the way the game ended has reminded me of the importance of finishing. Our culture is seething with complacency, and the Super Bowl was simply a microcosm. As I assessed the Falcons’ collapse, all I could really think about was how I do the exact same thing. We see it happen in every day life all the time. Even more often, it happens without us ever seeing it. People start something then fail to follow through. A healthier lifestyle, building a savings account, books (reading and writing), ideas we never do anything with, relationships that run into disagreement, being part of a small group, initiating friendships and so much more. And in one breath, I can say I see this all around me, but I can’t even take another breath without acknowledging my own personal struggle. In this season, I see it in my commitment to take time to write. I want to do it. I have the ideas already in my head. I think about them in the shower and on my walks to work. But when push comes to shove, actually choosing to create the margin and focus it takes to write is much more difficult than thinking about it. The Super Bowl was more than two weeks ago and the post hasn’t been written until now. It’s hard, like playing the Patriots in the Super Bowl. And there’s no room for you in this pursuit to be a finisher. Complacency might be our greatest enemy. It’s easier to skim social media a little longer, watch one more episode of This Is Us, eat one more bowl of Blue Bell or hit snooze just a little longer. Y’all, we are naturally lazy people. And the only way to combat this is to proactively play with a chip on our shoulder every day of our life. If not, 25 point lead or not, we will lose. We may make it all the way to whatever the Super Bowl is of our lives, but we won’t ever fully taste what it’s like to be the victor. I’m playing to win. I’m keeping the chip smack in the middle of my shoulders. I’m combatting complacency at every turn, remembering that it’s seething in our culture, waiting to strike. This doesn’t mean I’ll always win by the world’s standards. The Patriots still may snag the Super Bowl after a valiant comeback, but I will live in a way that I’ll never look back and wonder what could have been. So today I write the post I’ve been thinking about for two weeks. The good news is, the old saying better late than never is true when it comes to combatting complacency in our lives! But it all starts with a choice. Letter #78: Hawaii: Comfort Zone? You are easy to get caught up in. It’s comfortable for me to go to work all day, then make a sandwich for dinner. It’s challenging for me to think through what I’m going to cook, have already grocery shopped to have the ingredients and make a home-cooked meal. It’s comfortable to have Chili’s be my go to restaurant in Branson (I love their salsa!). It’s hard, umm…ok, more of an out of my norm, to try a new, local Branson joint. It’s easy to lay in my bed until 7:30, throw myself together and make it to work by 8. It’s SO hard to get up at 6, do Insanity, then go to work. It’s comfortable for me to simply maintain the relationships I have in my life currently. It takes effort to branch out and make new friends in a new place and to be honest, it’s awkward at times. We say we want to avoid you, but if we’re honest, we enjoy how easy life can be in the middle of you. You are hard, inconvenient and challenging to distance ourselves from, but if we’re going to grow into the people the Lord intended us to be we have to branch out. Taking steps of faith, getting to a point of being uncomfortable and experiencing newness or change allows us to see God working rather than relying on ourselves. Today, my friend Sam Pace leaves Branson. I knew Sam from OSU, but we weren’t great friends. 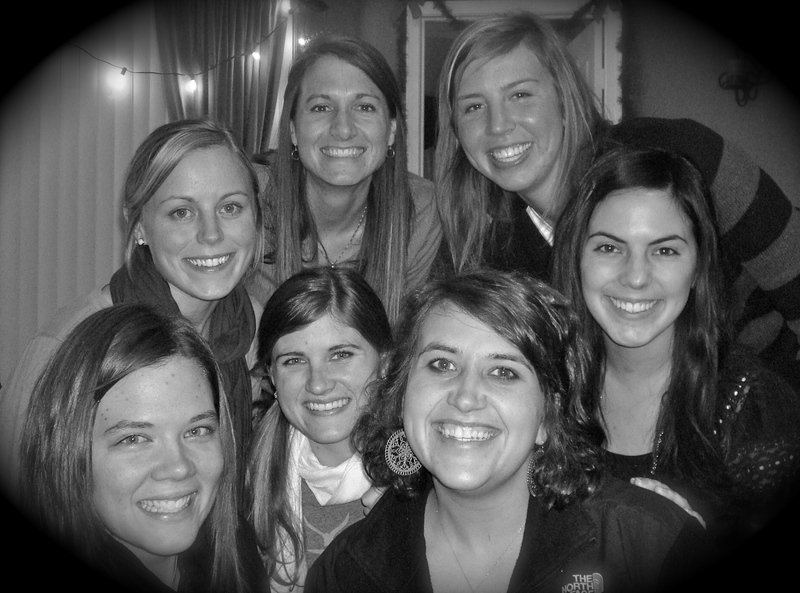 Then, we went to the Kanakuk Institute together and became better friends. 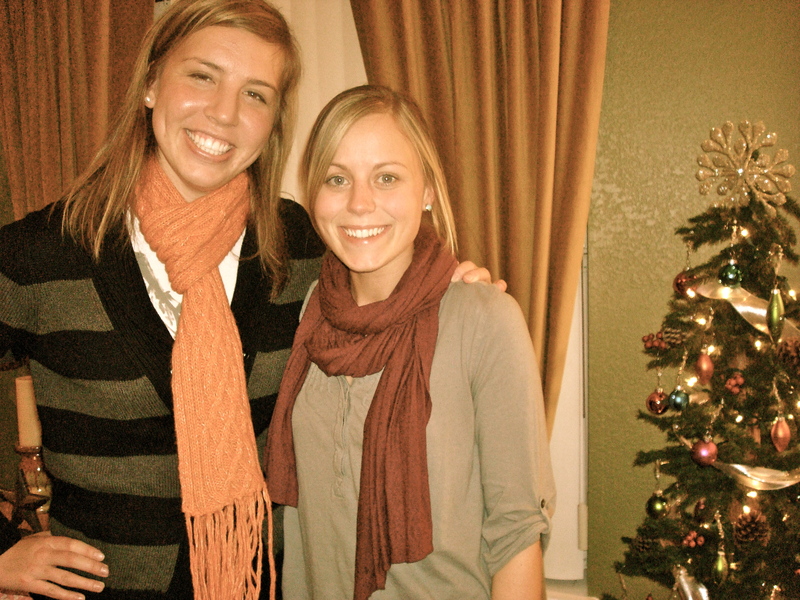 Then, she decided to stay in Branson for a semester to nanny and apply for law school, and our friendship solidified. Today, she departs to go home for the holidays, then she’s moving to HAWAII for the semester before starting law school! This is the epitome of stepping outside of you, and today, I am inspired to get out of mine. She is moving there knowing one person. That’s it. Now, don’t get me wrong…it’s not like the beauty of the island is going to be trying, but not knowing people, not having a job lined up, not knowing the culture…this is a leap of faith. Plus, I now have an excuse to vacation in Hawaii! These are pictures from her going away party. 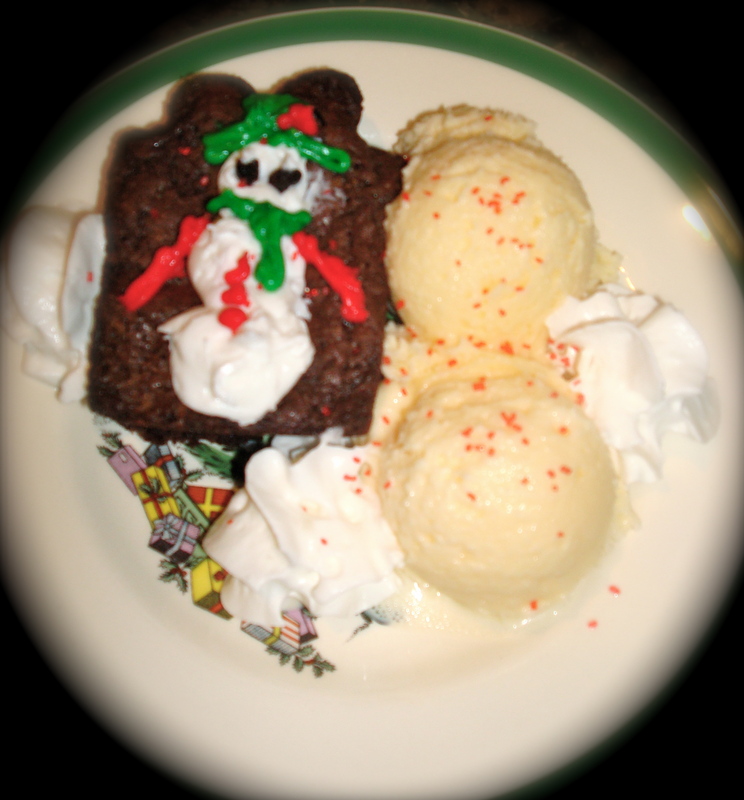 We even decorated brownies! I made this! OK, Frosty is a bit deformed, but this is a big step for me in my craftiness! 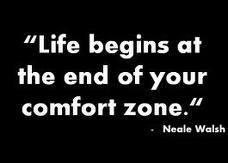 I don’t know who Neale Walsh, but I love this quote from him: “Life begins at the end of your comfort zone.” I don’t know if my life began because I started Insanity, but I do know that often times when I’m outside of you, I see the Lord working more in my life than when I’m in the middle of you. Sam, enjoy ‘beginning your life’ in Hawaii, as I learn to step out of being comfortable here in Branson. Posted on December 17, 2010 July 7, 2011 Author lindsayrotherCategories UncategorizedTags branch out, comfort zone, complacency, easy, Hawaii, InsanityLeave a comment on Letter #78: Hawaii: Comfort Zone?